Corner Hostel Malta i Sliema, Malta: Bestill nå! Corner Hostel Malta offers private rooms and shared rooms in a tranquil environment with true Maltese character. Corner Hostel Malta is a completely refurbished and renovated original townhouse with modern and practical facilities to make your stay as easy as can be! For us at Corner Hostel Malta, it is of utmost importance that you feel welcome, at home and relaxed to make the best of your stay in Malta. And what is more? All the necessities; all the facilities under one roof. Meet other travellers, tourists, backpackers and students from around the globe to experience the true meaning of travelling at an affordable price! A lovely living room to relax, read a book, watch a movie, use FREE Wi-Fi facilities or just mingle around with others is situated on the ground floor next to the fully equipped kitchen and dining area! Plenty of trips and tours can also be booked at our reception! Corner Hostel Malta offers rooms on three floors, all served with lift. Corner Hostel Malta offers 40 beds available in female only, male only or mixed shared rooms, each with 4 beds, and private twin rooms. 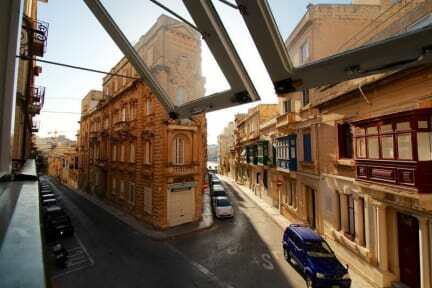 Corner Hostel Malta has very bright and airy rooms all with plenty of natural daylight from windows or balconies overlooking a tranquil setting of the daily town life. All rooms have private bathroom facilities most of which are en-suite. 24hr hot showers are included. Bed sheets are provided for free (and towels are also available for a small additional fee). Each bed is equipped with reading lights and has a very good-sized lockable wardrobe. Rooms have telephone access, table and ceiling fans. Check-in from 2 p.m - 10 p.m (otherwise we need to be informed in advance). Eco City Tax of 50c per adult 18+, per night to be paid in cash on check in. We accept payment by cash and credit card.